Enjoy taking the battery out of your LG G5 while you can because a new report says LG is ditching this feature in its next flagship phone. The LG G6 battery will not be removable, according to a person familiar with the firm's plans who revealed this detail to CNET. Instead, the smartphone's battery will be sealed in, allowing for a waterproof design. Non-removable batteries are a fixture now of Apple iPhones and Samsung's Galaxy S series, but LG was one of the few phone makers that still allowed users to extract the battery as they pleased. This feature helped LG stand out, especially when Samsung took the step to seal its smartphone batteries two years ago. The times are changing, however, and with the LG G6 set to launch at next month's MWC 2017 conference, it seems LG is going the way of its peers, closing in the battery in order to provide a buffer against water damage. LG teased the G6 was going waterproof in a video released two weeks ago. While waterproofing is a somewhat welcome feature (especially, if like us, you're prone to dropping your phone near sinks), it's likely some users will balk at LG's turn to non-removable batteries. We need to get our hands on the device to see how much this changes the experience compared to other LG phones, but it's a marked departure from the company's previous flagships. 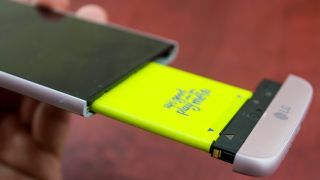 Some benefits of a removable battery include being able to swap it out if it's near the end of its life or resetting your phone by taking the pack out. Other notable LG G6 features include a more stylish look than its predecessor, a larger 18x9 screen with barely there bezels, and a Snapdragon 821 processor. The latter is especially notable as it's not the most recent Snapdragon 835 chip, however going with the older silicon lets LG beat the Samsung Galaxy S8 to market. The latest reports suggest the Galaxy S8 will launch on March 29, just over a month after the LG G6 is revealed. Finally, CNET says the LG G6 will have Google Assistant on tap, making it the second smartphone after Google's Pixel to use the virtual helper. LG apparently considered using Amazon's Alexa as the G6's personal assistant, but decided against it. Alexa is said to come to LG smartphones later in 2017, an interesting move considering the strong Google connection LG is forging across its devices.